On this combined helicopter and ground adventure from Las Vegas, prepare to be stunned by the vivid beauty of the Grand Canyon, along with another nearby natural treasure, Eldorado Canyon. 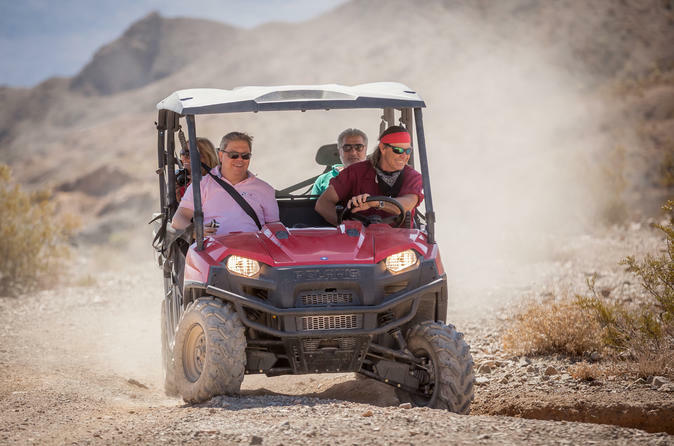 You'll fly from Boulder City over the West Rim of the Grand Canyon for panoramic aerial views, and then swoop down for a landing in Eldorado Canyon, where you’ll explore the desert landscape by ATV or Jeep, plus take a guided tour of Techatticup Mine. A boxed lunch is included; for a more memorable lunch experience, upgrade your tour to include an additional landing on the floor of the Grand Canyon, where you’re treated to a Champagne picnic. After hotel pickup in Las Vegas about 1.5 hours prior to your helicopter's departure time, you’re transferred to Boulder City Municipal Airport to board the state-of-the-art helicopter for the 35-minute flight to the Grand Canyon West Rim. Listen as you learn about the desert landmarks as you soak up views through the panoramic windows. Learn about the Black Mountains, Hoover Dam, and Fortification Hill, located in Lake Mead National Recreational Area, and watch for the Grapevine Mesa Joshua Trees and Grand Wash Cliffs Wilderness. Next, begin the 2-hour outdoor activity you selected when booking—exploring the desert terrain of Eldorado Canyon by ATV, Jeep, or kayak. You'll enjoy a boxed lunch including a sandwich, chips, cookie, and bottled water. After about 3.5 hours in Eldorado Canyon, board a shuttle for ground transfers back to Las Vegas.